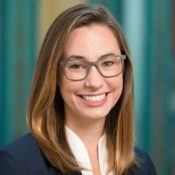 Ashley Hardin is an Assistant Professor of Organizational Behavior at Washington University’s Olin Business School, where she investigates interpersonal processes in organizations and how these processes are influenced by aspects of people’s non-work lives spilling into the workplace. She is motivated both by the central importance of relationships at work, as well as by the complex nature of one’s personal life becoming known in a professional context. Through her interest in these two aspects of organizational life, she is driven to shed light on four particular questions: how is personal knowledge of colleagues acquired; how does this knowledge alter interpersonal relationships at work; what are the individual, team, and organizational consequences of these particular types of interpersonal treatment; and finally how are these processes influenced by the organizational context in which they are embedded.